deadfrog.net » Blog Archive » It’s december! Time flies when you’re having fun. December is upon us. We’ve had our first real snow already and it’s cold. The house is a mess. We can’t seem to keep it clean. The dog is bored and I’m at work. Maybe I will bring her in one day. Today is my second month wedding anniversary.. My wife won’t let me forget. So for todays picture.. I didn’t take it, but it’s cool anyway so I’ll post it. 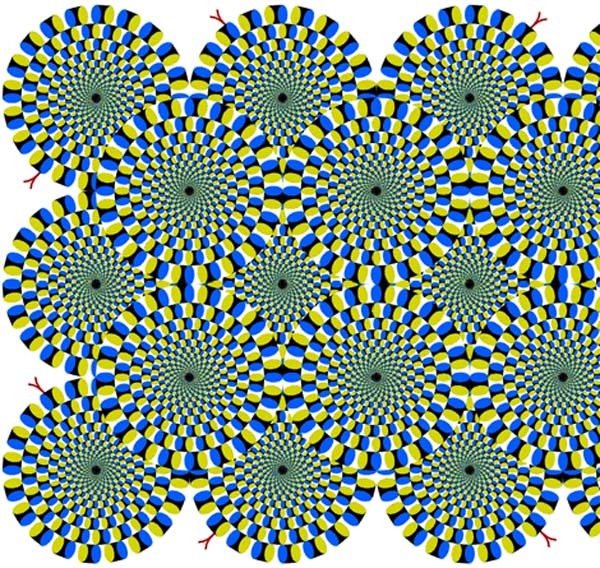 The picture appears to move, but it’s not moving. Look at any given spot and focus on it.. Everything stops moving but as soon as you move your eyes around the picture, things appear to move again. This entry was posted on Thursday, December 4th, 2003 at 11:57 am	and is filed under Photography. You can follow any responses to this entry through the RSS 2.0 feed. You can leave a response, or trackback from your own site.